There’s a whole lot of candy involved when my kids go Treat o’ Treating. Oh yes we do love the tradition of dressing up and going around our neighborhood and how some of our neighbors go all out with decorations and making Treat o’ Treating special for the little kids. But, the candy – oh the many many CANDY! My kids aren’t the candy-eating type (well I take that back…they would be if I let them! 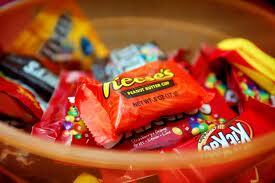 ), so what is a granola mama like me to do with all that candy? Enters — the Great Pumpkin Fairy. Every Halloween the Great Pumpkin Fairy goes around to every household (though she likes to wait until the house is quiet and all are asleep). And if there’s a pile of candy by the child’s bed, she’ll take it and thank them by giving the child a small gift in exchange. And so in our house after Treat o’ Treating, my kids get to pick a few pieces of candy (I do this by age, so at first it was one piece, now it’s more like 2-3 small pieces each kid) and then at bedtime, they pile all their candy in a dish and put it by their beds. They go to bed determined that they WILL wake up when she comes so they can see her, but you know how that goes…it’s like trying to catch Santa in the middle of Christmas night. And they go to bed full of anticipation of what the gift will be. I’ve kept the gift small each year – a wooden animal figure or a pretty bow, but each morning after Halloween has been met with happy smiles for their new gift and some “I missed her again!” from having slept through it all.